Some of new Oracle feature included in PostgresPlus Advanced Server 9.2 beta. Most of them are charm to the product and needed if anyone has migrated from Oracle to PostgreSQL. Many more new features in the product itself, however I would like to walk-through few of them which are related to Oracle compatibility. 1. Object Type Support: In this version, member functions are supported, but not yet MAP member functions. 2. Pl/SQL sub types : Now we can define own subtypes in the declarative part of any PL/SQL block, subprogram, or package. 3. DROP TABLE CASCADE CONSTRAINTS: This option will delete all foriegn key constraints that referencing the table to be dropped, and then drops the table. 5. TABLE() function call on Nested tables: A TABLE() enables to query a collection in the FROM clause like a table. 6. IN/OUT of UDT in function call: The functions udtabletype_in and udtabletype_out are now supported for nested tables. 7. Usage on reserved Keywords(LOG/CURRENT_DATE): Now LOG word can be used for naming the function. Also CURRENT_DATE, can be used for variable names. 8. STRING /NVARCHAR2 datatype support: Now STRING datatype and NVARCHAR2 for multi-byte data is supported for table column. String aliased to VARCHAR2 and NVARCHAR2 maps to varchar of PPAS data-types. psql is a great tool. Oftentimes, output of the particular command in psql is too big to fit on one screen, hence outputs are wrapped to fit in one screen which becomes output unreadable. 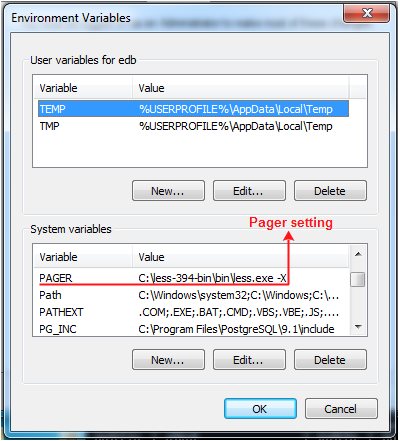 To custommize command output in readable format we have system variable called PAGER. If its on linux, I can simply set PAGER variable with LESS command + options to view command ouptut in readable format. Whereas on windows, you can customize psql output like linux, but with the help of windows tool less.exe which is similar to linux. Below, I copied download link of less.exe, download the binaries which are in zip format and unzip to your desired location. 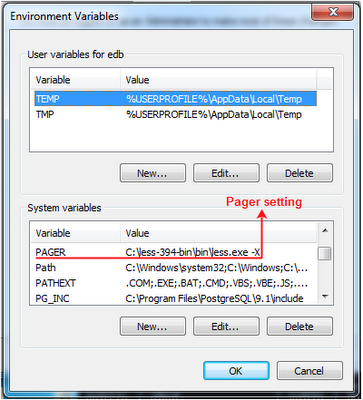 Now, set the windows system variable PAGER and VALUE pointing to the less.exe location. Also, include less.exe location in "Path". After setting system variable, your psql terminal has all sort of functionality like LESS command in linux. "less.exe -F <filename>", behaves as "tail -f" in linux. Many more feature in less.exe which I haven't tried but you can give a try and make your psql output eye-catching :).